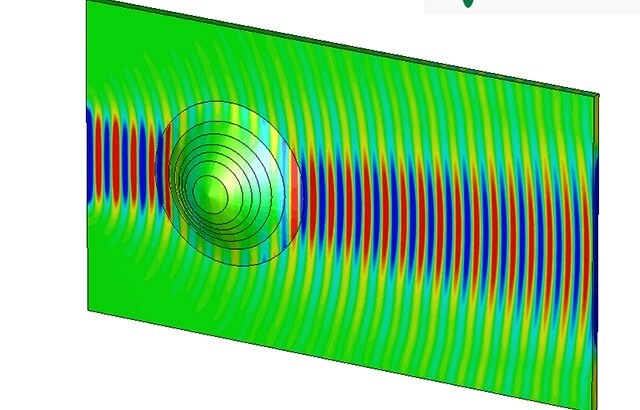 A team of researchers from Queen Mary University of London’s (QMUL’s) School of Electronic Engineering and Computer Science, worked with UK industry to develop the first ever practical cloaking device, which enabled curved surfaces to look flat to electromagnetic waves. The material has nano-size particles, which help to enhance specific properties on the surface of the object, giving the material the ability to make an object disappear. The research may not lead to the invisibility cloak popularized by J.K Rowling’s Harry Potter books just yet, but the demonstration could lead to a step-change in the way antennas are attached to their platform. Antennas of various sizes and shapes can be attached in clumsy areas and a broad range of materials using this method. The design is based upon transformation optics, a concept behind the idea of the invisibility cloak. Previous research has shown this technique working at one frequency. However, we can demonstrate that it works at a greater range of frequencies making it more useful for other engineering applications, such as nano-antennas and the aerospace industry. The researchers selected a curved surface with a similar size to a tennis ball, and coated it using a nanocomposite medium. The medium has seven different layers termed as graded index nanocomposite, where the electric property of every layer differs according to the position. The resulting effect is to ‘cloak’ the object. This type of structure can conceal an object that would typically have caused the wave to be dispersed. The fundamental approach of the design has much more extensive applications, which range from microwave to optics for managing any sort of electromagnetic surface waves. The study and manipulation of surface waves is the key to develop technological and industrial solutions in the design of real-life platforms, for different application fields. We demonstrated a practical possibility to use nanocomposites to control surface wave propagation through advanced additive manufacturing. Perhaps most importantly, the approach used can be applied to other physical phenomena that are described by wave equations, such as acoustics. For this reason, we believe that this work has a great industrial impact. The research was presented in Scientific Reports journal, and EPSRC programme grant – QUEST (The quest for ultimate electromagnetics using spatial transformations) financially supported the team's research.